Although food is not exactly high on the priorities of survival, it is on people’s mind a lot! It also pays to know some things about wild food for various reasons; it can stave off the boredom that is likely to set in, it can keep up the spirits as well as provide some sorely needed vitamins and minerals. But should you find yourself in a survival situation you can’t simply go out and gather some food. It requires prior knowledge, otherwise there is the possibility you could be turning your survival situation into one with a very detrimental outcome. Learning about wild foods is fun and a journey not a destination. There is an abundance of food out there, ripe for the picking, if you know where to look. This can be food that is foraged from your local neighbourhood, weeds, natives, and what is lovingly referred to as garden-escapees. Fennel, garlic, dandelion, rosehips and puha are all such common and easily used ‘wild’ foods. The secret lies in getting knowledge, practice, knowledge and practice. Start simply. We have mentioned some easily obtained wild foods on this website before such as dandelion or onion weed. Start by really incorporating these foods into your daily life and then think about the more ‘survival’ type foods such as the cabbage tree, the black fern or the supple jack. Winter is here again in New Zealand, and it is a good time to remember some critical survival skills that you need in cold weather. All those lovely summer images of foraging for food, swimming in rivers and sleeping under the stars are far less relevant in a cold and wet wintry wilderness. Cold weather can catch the unawares and quickly lead to hypothermia. The wind is one of the most dangerous elements in cold weather. Getting out of the wind, and cold, is a real priority. Your clothes are an important part of your protection. Read more about clothing in cold weather survival here. Obviously a fire will greatly assist in keeping you warm, but don’t be deceived building a good fire in the winter is more challenging than it appears. Here are some good tips on building fires: basics and tinder and kindling. Don’t forget to eat and drink, keeping the energy up and spirit resilient! 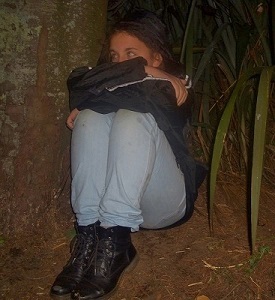 You are lost, cold, miserable and totally alone in the bush. Night is setting in and you have built a simple shelter that will keep you reasonably comfortable, you are okay for water and hunger has not yet set in. If you have managed to keep a lid on fear and succeeded in obtaining some shelter and are in not immediately in any life threatening danger, your next battle will most likely be with depression, fatigue or boredom. These three stressors are intertwined. Boredom can lead to depression, depression can lead to fatigue, and fatigue can increase feelings of depression and so on. In a survival situation feelings of loneliness and sadness can be stronger than most of us imagine. There are many, many things that you can teach your children about safety and survival in the wilderness. But the most important thing to teach your children if they ever get lost is to stay put. Most of like to think our children would never find themselves in a situation where they are lost and alone. We (as brilliant parents) simply won’t allow that to happen! But then again anyone who is a parent also realizes how quickly things can happen with children. A moment of inattention and everything can change. Hopefully you are well prepared when taking children outdoors and if anything goes wrong, you will be there to deal with it. However, good preparation takes account of planning for the worst case scenario and this includes the possibility that your child may get lost and be alone. Ideally your child will have some survival equipment attached to their body (back pack or belt bag) and know how to use the contents. Failing that at the very least your child should have adequate clothing, a whistle and water on them when you go in the great outdoors. Regardless of age all children should be taught to stay where they are when they realize they are lost. Teach your children to STOP & STAY. Imagine being lost, alone, possibly injured or in pain and having to face a cold night in an unfamiliar or hostile environment. How will you react? What emotions will you experience? Fear is a very common reaction to such a situation. Being in an environment where you have extremely limited control and only partial information can be terrifying. In a survival situation fear easily makes an appearance. Fear of the unknown, fear of discomfort, fear of one’s own limitations, fear of death and interestingly fear of embarrassment. Being psychologically resilient is a very important, but often overlooked, aspect of survival. At its very basic core having resilience refers to the ability to effectively cope with stress and challenging situations. It is often defined as having the ability to bounce back. In our view this means bounce back to your day to day life, but not necessarily the same one as you had before. Experiencing, and surviving, an adverse or extremely challenging situation changes you. This in itself can be a great resilience builder. One of the most important requirements for survival is the ability to accept the reality of the situation and react appropriately. In a survival situation you need to be able to call on your coping strategies and, perhaps most importantly, you need to have the skills of adaptive coping. Winter has well and truly arrived. Although most days are sunny, the nights sure are cold. If you are going into the outdoors, don’t be deceived by a lovely sunny day. As soon as that warm sun goes down the temperatures drop significantly. Never go out into the bush unless you are well prepared for surviving the cold. And that includes being prepared for the possibility to unexpectedly spending the night. Thermal and layers are the secret to ensuring a comfortable survival in a cold bush overnight! Remember to start preparing for the evening about an hour before the sun sets. If you leave it too late you will probably find yourself stumbling around with a torch trying to gather wood to get that fire going, just to have a little bit of heat. Most temperatures in the bush at this time of year are close to freezing. Especially high up and in exposed places (where you have amazing views) it can get cold quickly. Ever since we ‘rescued’ the chickens from a free-range farm, it has felt wrong to buy free-range chicken. Please don’t misunderstand, to those of you still buying chicken – please buy free range. It is definitely better than battery farmed. But not good enough for our liking. So we made a pact to only eat our own ‘free-range’ chicken. Knowing it has truly free ranged and had a good (if short) life was enough for us. But despite most websites making it look easy and positive, there are a few issues to raising your own chickens. Exciting news! Waypost Survival has moved to the sunny Hawke’s Bay. This is the reason we have been so quiet lately, busy moving, setting up a new homestead and scoping out new wilderness spots. 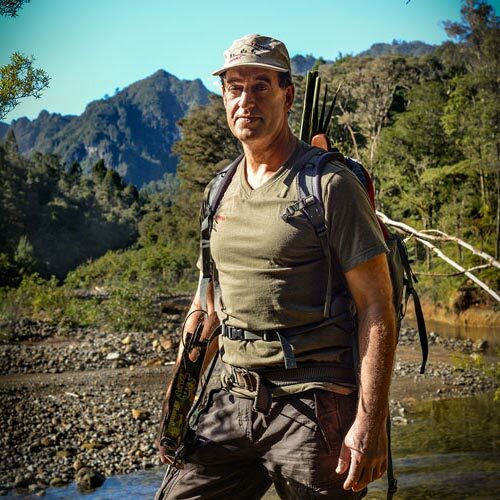 The Hawke’s Bay provides amazing opportunities for all sorts of hunting and wilderness activities. We have added ‘prepping’ to our homesteading section. Prepping is no longer the domain of the paranoid and doomsday believers. It has become a thing for anybody who wants to be independent during a calamity. Being prepared means you are capable of protecting, and providing for, your family in any adverse event. We consider learning wilderness survival skills, gaining wild food knowledge and some basic homesteading techniques all important aspects of prepping. Certainly if you consider yourself an outdoor enthusiast, you need to prepare yourself for the great outdoors by having basic wilderness survival knowledge. Being prepared is a necessity for anyone going out into the bush. But even with the best levels of preparedness you may find yourself without your gear and relying completely on your wits. Knowing what to do can make the difference between life and death. Our survival training will teach you things that will not only help you in extreme survival situations, but can be useful in everyday life too. Feel free to leave us a comment and let us know what you would like to learn more about. Check out the article we wrote for Lifestyle Block magazine on pig keeping. The next issue contains another article about pig slaughter. Waypost Survival provides you with the tools to approach any challenging situation with knowledge and confidence.